Joel Feder July 3, 2018 Comment Now! In this SUV-crazy era, we don't see enough bankers’ hot rods anymore, but the mad scientists at AMG have a machine to feed the few who desire one. 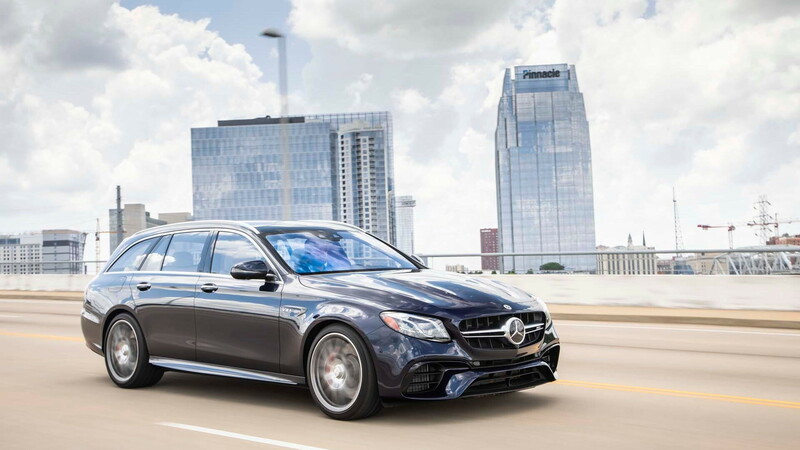 The 603-horsepower 2018 Mercedes-Benz E63 S sedan is bonkers in the best possible way, but it has a sibling that is even stranger while being more practical. For those who need to haul the kids, the soccer balls, and all the bagels while being cosseted by quilted leather, real wood, LED mood lighting, and a built-in fragrance dispenser, may we suggest the 2018 Mercedes-AMG E63 S wagon? The Mercedes-AMG E 63 S is new for 2018, and we've driven the sedan in various places, from the streets and track in Portugal to the ice on Manitoba, Canada's Lake Winnipeg, but the E63 S wagon had thus far escaped us. 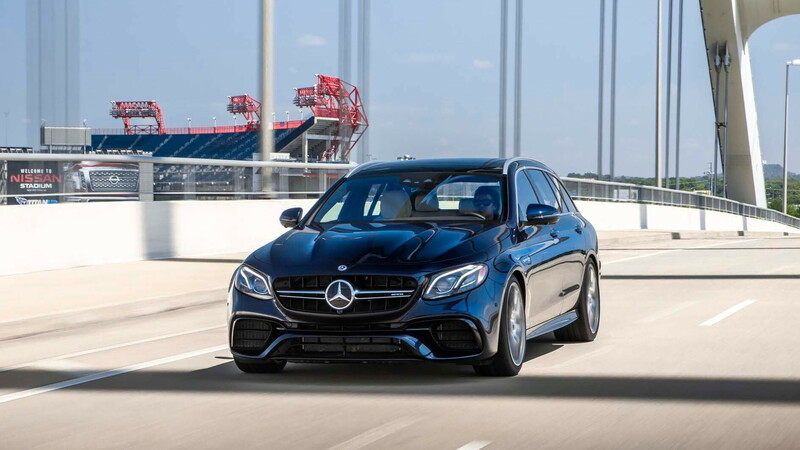 Mercedes-AMG recently remedied that by putting us behind the wheel of the longroof on the sprawling roads in and around Nashville, and for good measure, adding time on the track at NCM Motorsports Park in Bowling Green, Kentucky. 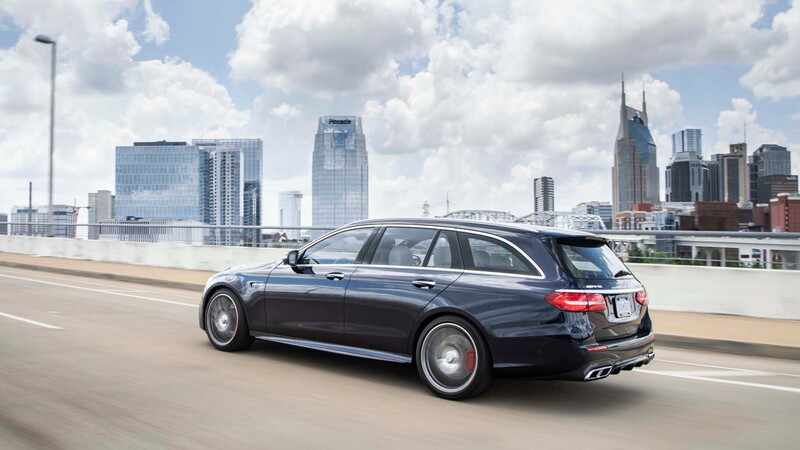 This AMG-built wagon fires out 603 horsepower and 627 pound-feet of torque from its hand-built 4.0-liter twin-turbo V-8 engine—a far cry from the overtaxed lump in Mom’s station wagon back in the day. Coffee and bagel runs will be quick with all four wheels clawing at the pavement for a 0-60 sprint of just 3.4 seconds, a mere 0.1 second slower than the sedan. All that power is managed through a 9-speed automatic transmission with a wet-plate clutch standing in for a torque converter. On cold start, the twin-turbo V-8 sounds mean, and things only amplify from there with 7,000 rpm redline shifts firing angry barks through the quad exhaust tips. Full throttle quickly re-sorts your insides as the German missile lunges forward regardless of the current speed. Driving the E63 S wagon on the street is an exercise of restraint, as the speedometer can easily crest 100 mph in a blink. While such speeds would normally pose an issue when one happens upon a friendly police officer, the wagon body body style makes this German bruiser nearly invisible. And if you spot Smokey first, the 15.4-inch brake discs, clamped down upon by 6-piston front calipers, haul the car back to legal speeds before he can think to point his radar at that boring wagon. On the track, the longroof delivers 99 percent of the sedan’s performance. It’s 154 pounds heavier, so that accounts for the slightly slower acceleration. The extra weight is planted firmly in the back, and it translates into a bit more body roll, and a greater willingness to go sideways when pushed hard around a corner. In the wagon, it's important to make sure the tail doesn't kick out too far or too often if you are chasing lap times. But then again, who chases lap times in a wagon? Track or street, the air suspension provides a firm, yet never overly harsh ride, even over broken pavement around Nashville. The steering feels natural and direct, with good feedback from the road. The new 2018 BMW M5 provides a bit more feel through its steering wheel on a racetrack, but that car is far likelier to end up on a track. The E63 S is the closest thing to a German muscle car, and that means it’s puffed up and pumped up in every way. 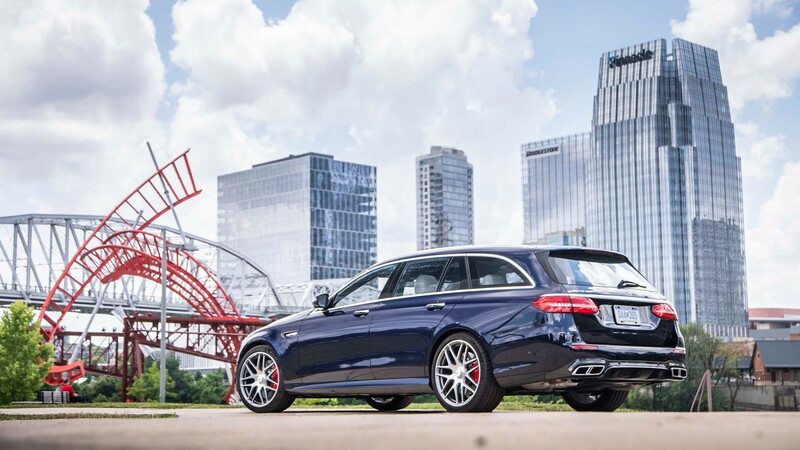 The wagon shares the E 63 sedan’s front fenders that swell out two-thirds of an inch compared to those of a pedestrian E-Class to house the wide, staggered 20-inch wheels and tires. Like every AMG today, quad exhaust finishers out back give away that this car comes from Affalterbach. Gaping front air intakes contribute to an overall menacing look, yet somehow the E 63 S wagon's design comes off as understated. Inside, the E63 S wagon combines the luxury of an E-Class with a dash of sport. The black nappa leather flat-bottom steering wheel and front sport seats that hug in all the right places both remind occupants this isn’t a standard E-Class wagon; it's an AMG. However, the utility is really the star, with 35.0 cubic feet of cargo capacity behind the rear seats. That swells to a crossover SUV-like 64.0 cubes with the second row folded. 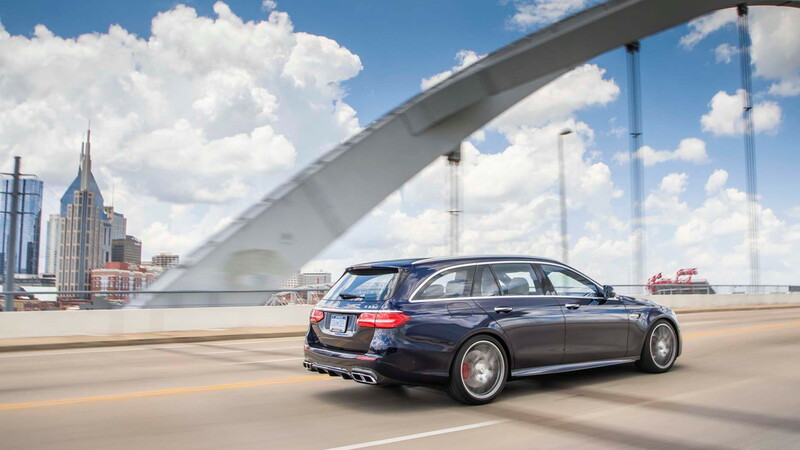 Priced from $107,945 to start, the E63 S wagon is downright expensive—especially at $130,300 as tested. Fully loaded, the wagon can cost more than $140,000. While there are a grand total of zero direct competitors, a Jeep Grand Cherokee Trackhawk or Porsche Panamera Turbo S E-Hybrid Sport Turismo offer about the same performance and people hauling capabilities. The Jeep costs much less, while the tech-laden Porsche runs far more. The 2018 E63 S wagon occupies a weird space, and AMG knows it as it only sells about 300 a year in the U.S.
For those 300 buyers, the bagel run will never become boring. The bottom line: It’s in a class of its own, which is fine because sometimes bagel runs could use more than 600 horsepower.